It is extraordinary to have such a high concentration of leadership at one institution, but, then, Cooper is an extraordinary hospital. Cooper University Hospital is the center of a growing health sciences campus that includes the hospital, Cooper Medical School of Rowan University, MD Anderson Cancer Center at Cooper, the internationally acclaimed Coriell Institute for Medical Research, Sheridan Pavilion at Three Cooper Plaza medical offices, and the Ronald McDonald House. Adjacent to the Cooper Plaza/Lanning Square neighborhood, Cooper has a long history of outreach and service efforts to its local community. Some of these initiatives include health and wellness programs for the neighborhood, developmentof neighborhood parks and playgrounds, and outreach to programs into local schools. The hospital’s 312,000-square-foot, 10-story Roberts Pavilion features an expansive lobby and concourse, a restaurant and coffee shop, health resource center, business center, gift shop, and chapel. State-of-the-art patient care facilities include private patient rooms, technologically advanced operating room suites with hybrid imaging capabilities, and an advanced laboratory automation facility. The Emergency Department features 25 beds, dedicated isolation suites, and autonomous CT scanning technology. Designated floors serve specific patient populations including those needing advanced surgical and heart care, along with South Jersey’s only dedicated 30-bed inpatient cancer unit. Also in the Roberts Pavilion is the 25,000-square-foot Dr. Edward D. Viner Intensive Care Unit—featuring 30 private patient rooms equipped with the latest in advanced technology, and allowing 360-degree patient access. Five patient rooms are capable of negative pressure isolation, and five rooms have chambered isolation alcoves. In addition, an enlarged room with operating room caliber lighting is outfitted to perform bedside exploratory laparotomy in patients too unstable for transport to the operating room. MD Anderson Cancer Center at Cooper, a four-story, 103,050-square-foot center located on the Cooper Health Sciences Campus in Camden, is dedicated to cancer prevention, detection, treatment, and research. The center includes bright, spacious chemotherapy treatment areas, patient exam rooms, a conference center, and advanced diagnostic and treatment technologies. The design incorporates an aesthetic approach to healing with abundant natural light, a rooftop Tranquility Garden, an illuminated floor-to-ceiling “Tree of Life” centerpiece, and more than 100 pieces of original art created by 71 New Jersey artists. 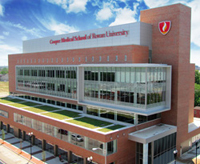 Cooper Medical School of Rowan University’s (CMSRU) Medical Education Building is located on the Cooper Health Sciences Campus on South Broadway, between Benson and Washington Streets in Camden. The building, which opened in July 2012, was designed for CMSRU’s curriculum with spaces and technologies to support faculty and students in their educational process. The Cooper Health Sciences Campus is located in the heart of Camden’s business district. The academic medical center campus is easily accessible by car or public transportation via the commuter high-speed line and bus terminal adjacent to the hospital. Cooper is a short walk or drive from the exciting Camden waterfront which includes a magnificent waterfront park and marina; the Adventure Aquarium; and the BB&T amphitheater, which hosts nationally renowned entertainment throughout the year. Nearby are the Sixers Training Complex, L3 Communications complex, Lockheed Martin, Rutgers University Camden Campus, and Camden County College. There are expected to be $350M in transportation and infrastructure improvements within the next four- to five- years to handle the influx of thousands of new employees to the area and students at nearby growing academic campuses. Cooper is conveniently close to Philadelphia. Just a mile-long drive over the Benjamin Franklin Bridge will put you at the doorstep of Philadelphia’s cultural, culinary, and historic venues. South Jersey also offers a range of living and entertainment options. Quaint towns such as Haddonfield and Collingswood are just 10 minutes away. The lights and action of Atlantic City and popular beach towns such as Cape May and Ocean City are a one-hour drive from Cooper.